According to the latest metals and mining research by S&P Global Market Intelligence, gold production increased for the tenth consecutive year in 2018 to 107.3 million ounces (Moz), and is expected to reach a new record high of 109.6 Moz in 2019. The research group noted that the year-on-year increase was just under 1%, the smallest in the last decade. To put that into perspective, output has risen by 40% since 2008. 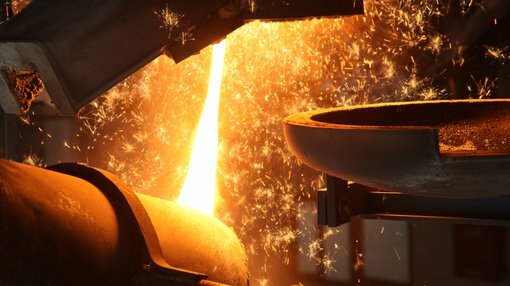 In terms of industry direction, research analyst at S&P Global Market Intelligence Christopher Galbraith made some important observations in saying, "We believe the forecast growth of 2.3 Moz in 2019 will be the strongest growth in the past three years, debunking commentary calling for peak gold. 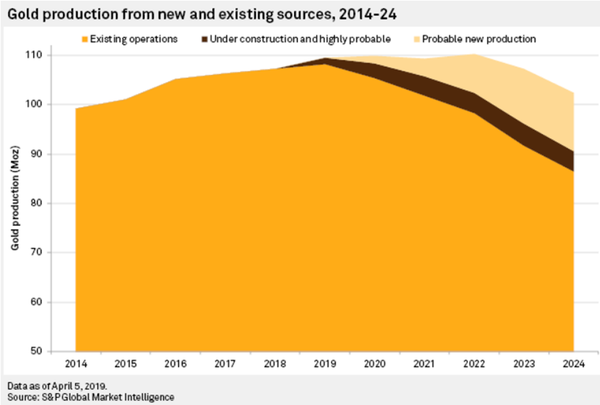 “More than half of the increase is projected to come from new mines that are expected to come on stream this year or have recently commissioned." It is worth looking at a 10 year snapshot from 2014 to 2024 in order to ascertain where the growth has been coming from and what countries are going to lead the way over the next five years. New mines coming on stream include Gruyere in Western Australia (50% Gold Fields Ltd., 50% Gold Road Resources Ltd.), which is expected early in the June quarter, Meliadine in Canada and Sigma-Lamaque in Quebec which has already commissioned, as well as restarted operations at Obuasi in Ghana and Aurizona in Brazil, both of which have been idle since 2015. Galbraith added, "Looking at the current project pipeline, we expect output to stay steady until 2022 due to advancements at developing projects. 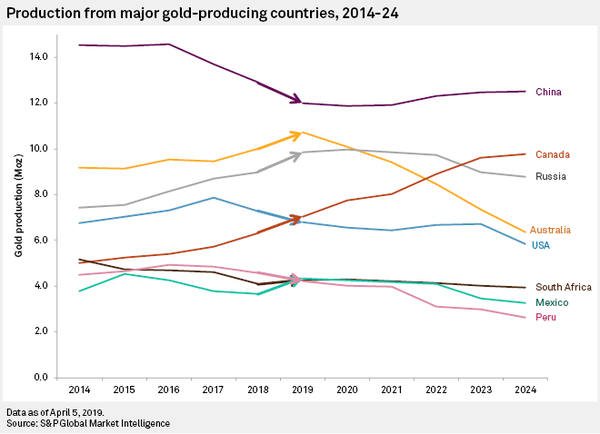 “From there on, gold production is expected to fall by over 3 Moz in 2023 and up to 5 Moz in 2024." By 2024, Canada is the only major gold-producing country to increase output, while Australian production is expected to fall the most, a sobering outlook for a country that has historically relied heavily on the mining industry for employment and economic growth. It needs to be taken into account that many of Australia’s largest producing mines transitioned from a piece of arid land without a drillhole to peak production in the space of five years. Consequently, Galbraith’s projections aren’t so much an indication of the health of the Australian gold mining industry, but a near-term outlook based on current projects, particularly larger ones that are relatively advanced. Investors who target stocks in the gold sector have learned over many years that much of the money is made in the early stages of discovery and development, a period in which share prices tend to accelerate quickly. Importantly, Australian miners are well incentivised to bring new production online in their home country, particularly given foreign exchange rates which currently imply an Australian dollar gold price of $1780 per ounce. Even when the gold price hit an all-time high of about US$1900 per ounce in November 2011, such was the strength of the Australian dollar against the US dollar that the Australian dollar gold price was approximately $1800 per ounce, broadly in line with where it is today. This makes Australia one of the highest margin gold producing countries, and when one combines that with factors such as established infrastructure linking remote areas, a highly experienced mining workforce and the lack of sovereign risk that is present in some areas of Africa and South America, it is hard to imagine that there will be any long-term hiatus in production. Indeed, the sector wouldn’t be as active as it is if there wasn’t recognition of the rewards on offer. With Australia having an enviable track record when it comes to large discoveries, it may be a good time to examine our home-grown gold explorers that could be on the verge of uncovering the next Southern Cross or Telfer deposit. 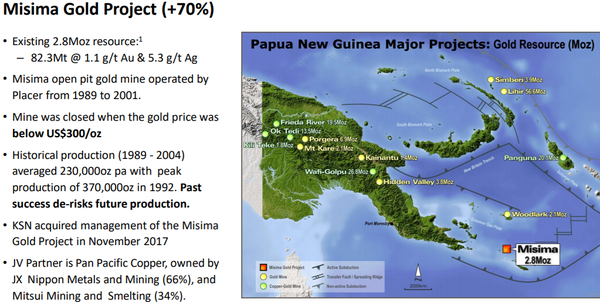 As we trawled through the extensive range of emerging gold projects in Australia, we came across Kingston Resources Ltd (ASX:KSN), a company with a prospective high grade opportunity in Australia and a 70% stake in the well advanced Misima Gold Project in a proven area of Papua New Guinea (PNG). The latter has a history of 130 years of successful and profitable gold mining, and the area is still the subject of active artisinal mining today. The mine has an existing resource of 82.3 million tonnes at 1.1 grams per tonne gold and 5.3 grams per tonne silver for 2.8 million ounces. Between 1989 and 2004 the average production was 230,000 ounces per annum, and a high of 370,000 ounces in 1992. Such were the robust economics of the project that the mine only closed when the gold price fell below US$300 per ounce, about US$1000 per ounce below where the precious metal is currently trading. After funding further exploration in the March quarter, Kingston’s stake in the project is expected to increase to 75% with the group’s joint venture partner Pan Pacific Copper owning the remaining 25%. The following table puts the size of the Misima resource into perspective relative to other major projects. 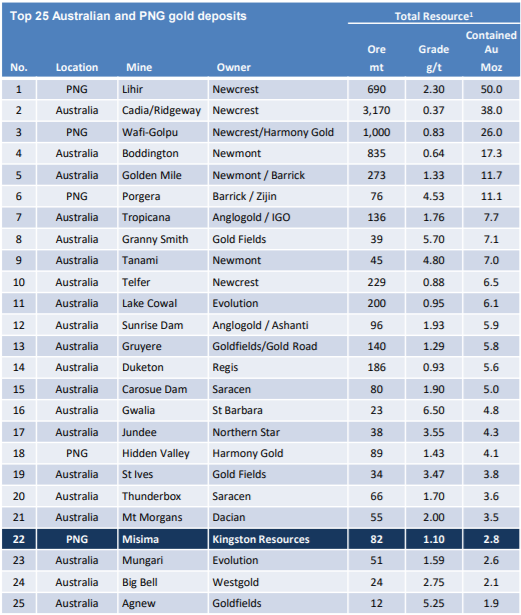 The next table not only demonstrates the size of the company’s resource (right-hand side) against one of the largest emerging projects referred to by S&P Global (Gold Road’s Gruyere Project in Western Australia), but it also highlights the undervalued status of Kingston Resources on an enterprise value to resource ounces scale (left-hand side). 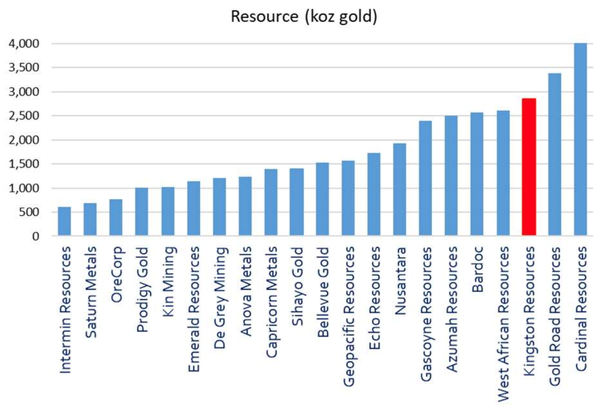 If you had to identify a reasonable peer comparison, West African Resources (ASX:WAF) would be a useful gauge. As indicated in the right-hand chart the size of its resource is only just shy of Kingston Resources, and similarly both companies have projects that are yet to come into production. However, on that note Kingston Resources should be in a position to move relatively quickly in 2020, given it is developing a project that was previously in production. In view of this comparison it is quite astounding that WAF’s market capitalisation is approximately $280 million, while KSN has a meagre market cap of $24 million. While this mismatch must be frustrating for management, it certainly presents as an opportunity for investors to get a slice of a stock that not only represents value for money at this stage, but given exploration results there appears to be further upside. Adding further flavour to the story is the fact that a survey in March confirmed the location of a large stockpile of gold mineralised material at the project. This near-surface stockpile is not accounted for in the current gold resource at Misima. The survey has provided highly accurate data and modelling of the surface terrain which has assisted in identifying historical mining topography, current and historic artisanal mining, as well as identifying potential geological features and determining water drainage patterns. A stockpile of mineralised material left by the previous operator (Placer) has been confirmed at the Cooktown Dump, a large area adjacent to the Tonowak Pit reported to contain 3.6 million tonnes of low-grade material averaging between 0.5g/t and 0.7g/t gold. This dump, which was capped with topsoil and rehabilitated during the closure process, remains intact, with its current position matched against mine survey files created during mine closure. When the mine was active, Placer’s economic cut-off was 0.7g/t gold for mill feed. Lower grade material in the range 0.5 to 0.7 grams per tonne gold, was stockpiled. While the grade of the Cooktown Dump is modest, it is important to note that it represents loose rock, at surface and is close to the likely location of a future processing plant. Management highlighted that the inclusion of such ore had the potential to reduce mining and processing costs, and on this note it has set an exploration target at the dump of 3.6 million tonnes at 0.5 grams per tonne to 0.7 grams per tonne gold, delivering in a range between 58,000 ounces and 81,000 ounces. Not only has Kingston been successful in delineating much higher grade mineralisation than that indicated by the current resource, it has also extended the size of the resource. Misima field work commenced in December 2017, delivering immediate success with the discovery of a new prospect, Ginamwamwa, located adjacent to former mill site. Channel samples at surface included 14 metres at 12.2 grams per tonne gold and 35.5 grams per tonne silver, as well as thicker intersections such as 34 metres at 3.2 grams per tonne gold. It was further exploration work at east Ginamwamwa that extended a large area of high-grade shallow gold mineralisation including 14 metres at 17 grams per tonne gold which featured fine visible gold. There was also a small intersection of 2 metres grading 140 grams per tonne gold. 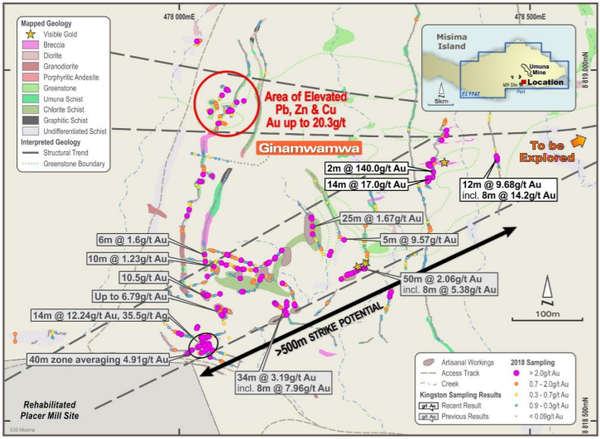 Commenting on this development, Kingston Resources’ managing director, Andrew Corbett said, “Ginamwamwa is continuing to deliver some amazing gold grades near surface. With multiple and untested targets over eight kilometres of prospective strike there is enormous upside potential from exploration, and there is a school of thought that this could provide feed for a high-grade, near surface, starter pit. Kingston Resources also owns 75% of the Livingstone Gold Project which holds a 50,000 ounce resource and is the site of a number of high grade historic intersections. 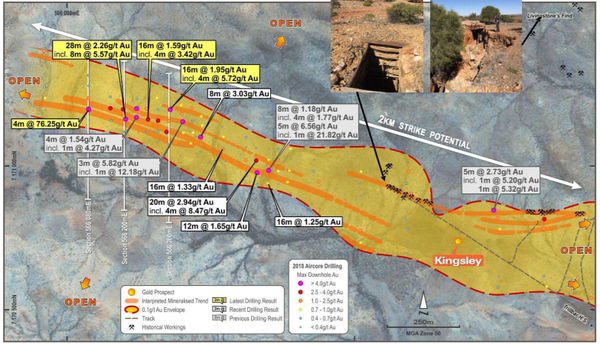 The project is 140 kilometres north-west of Meekatharra in Western Australia and it is situated in an area that hosts numerous old workings, many of which featured high grade gold mineralisation. Drilling in October 2018 revealed shallow intersections such as 20 metres at 2.9 grams per tonne gold and 8 metres at 3 grams per tonne gold. However, there was even better news to come as the company revealed assay results in November that featured both strong grades and broad intercepts. These included 4 metres at 76.2 grams per tonne gold from 88 metres and 28 metres at 2.3 grams per tonne gold from surface. Mineralisation extends over one kilometre and remains open along strike and at depth. Importantly, the company has managed to increase its landholdings since these results were received. The new licence application consolidates Kingston’s position over more than 40 kilometres of prospective strike. It is worth noting that this area hosted the Livingstone’s Find gold workings, the largest historic gold producing area in the Robinsons Range, producing 1260 ounces at an average grade of 21.8 grams per tonne gold. Expect to hear more on Livingstone in the June quarter with the potential to establish a maiden resource in 2019. As indicated below, De Grey Mining Ltd (ASX:DEG) is a large landholding surrounded by some of Australia’s best discoveries and long life, large production mines. The company has multiple assets, providing it with a range of opportunities in terms of executing its exploration strategy and prioritising the development of producing mines. This is a snapshot of how 2019 is shaping up for the group. With many initiatives in the pipeline, there is likely to be regular news flow potential and market moving developments, particularly on the exploration front. As indicated in the top line of the graphic, resource extension will be ongoing with management targeting 3 million ounces at a discovery cost of less than the industry average of $20 per ounce. The following chart highlights the company’s progress to date with reference to the key projects on the left-hand side. There was an important recent development in relation to the group’s Toweranna Project, which as indicated in the following graphic was already looking promising. 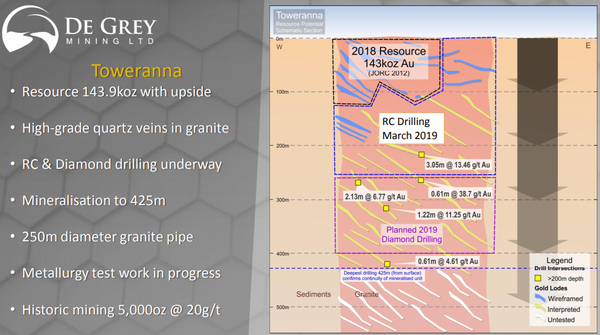 New drill results from Towerrana released this week included an intersection of 136 metres at 2 grams per tonne gold from 94 metres. Another thick intersection of 26 metres at 3.1 grams per tonne provided confidence that this is a much larger resource than that currently indicated. There were also some deeper high-grade intersections such as 29 metres at 4.4 grams per tonne gold from 200 metres. Management said that it was pleased with the new results as they confirmed strong gold mineralisation to at least 200 metres below surface, indicating that material resource extensions are likely with further drilling. The next goal is to extend the resources from 200 metres to 400 metres in depth with a view to identifying the bonanza high grade nature of some of the individual veins, perhaps opening up the possibility for underground mining. One of the key takeaways though was management’s view on the new style of mineralisation that was encountered as technical director Andy Beckwith said, “Importantly, the new drilling shows Toweranna has multiple stacked lodes across the entire intrusion, strong mineralisation extending at depth and remains open. Consequently, work programs have been accelerated to expand resources and test mineralisation down to a depth of at least 400 metres. Further deeper ‘scout’ diamond drilling to between 400 metres and 800 metres is also being assessed. De Grey is very much a watch this space stock with numerous share price catalysts having the potential to build on gains of approximately 25% since March.